Purveyors of the viewpoint that rising CO2 emissions pose a grave threat to the planet via dangerous global-scale warming presuppose that the surface temperatures of the Earth are highly sensitive to parts per million (ppm) variations in atmospheric CO2 concentrations. And yet the accumulation of scientific publications documenting a far less consequential role for CO2 in the climate system just keeps growing and growing — especially in recent years. An incomplete compilation of at least 75 scientific publications now document a very low climate sensitivity to CO2 concentration changes. Summarizing, doubling modern era CO2 concentrations from 280 ppm to 560 ppm may only raise surface temperatures by tenths of a degree – if that. 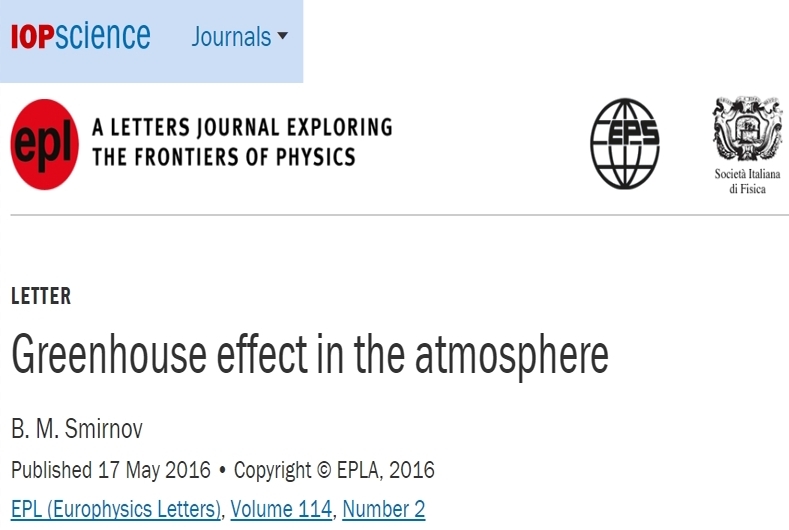 Expanding upon a 2016 scientific paper published in Europhysics Letters, Dr. Boris M. Smirnov, an atomic physicist, uses his field expertise in authoring another textbook entitled Microphysics of Atmospheric Phenomena. The volume is one of 20 physics books Smirnov has published over the last two decades. In chapter 10, Smirnov asserts that infrared emission from water vapor dwarfs the atmospheric contribution from CO2 within the greenhouse effect, as CO2 only “contributes in small portions“. In fact, Smirnov finds that doubling the modern era CO2 concentration will only result in a temperature increase of 0.4°C. He further calculates that the increase in CO2 concentration from 1959 (316 ppm) to the present (402 ppm) has only contributed 0.15°C to surface temperatures. This means, of course, that the bulk of the temperature changes that have occurred in the last 55 to 60 years are not of human origin. Steadily and gradually, the “consensus” position that says the climate is highly sensitive to variations in anthropogenic CO2 emissions continues to unravel. It is shown that infrared emission of the atmosphere is determined mostly by atmospheric water. One can separate the flux of outgoing infrared radiation of the atmosphere from that towards the Earth. The fluxes due to rotation-vibration transitions of atmospheric CO2 molecules are evaluated. Doubling of the concentration of CO2 molecules in the atmosphere that is expected over 130 years leads to an increase of the average Earth temperature by (0.4±0.2) K mostly due to the flux towards the Earth if other atmospheric parameters are not varied. [W]e take into account that CO2 molecules give a small contribution to the heat Earth balance and, therefore, one can use the altitude distribution of the temperature for the standard atmosphere model , and a variation of the CO2 concentration does not influence this distribution. … [I]njection of CO2 molecules into the atmosphere leads to a decrease of the outgoing radiation flux that causes a decrease of the average Earth temperature. But this decrease is below 0.1K that is the accuracy of determination of this value. Thus, the presence of carbon dioxide in the atmosphere decreases the outgoing atmospheric radiative flux that leads to a decrease of the Earth temperature by approximately (1.8 ± 0.1) K. The change of the average temperature at the double of the concentration of atmospheric CO2 molecules is determined by the transition at 667cm−1 only and is lower than 0.1K. 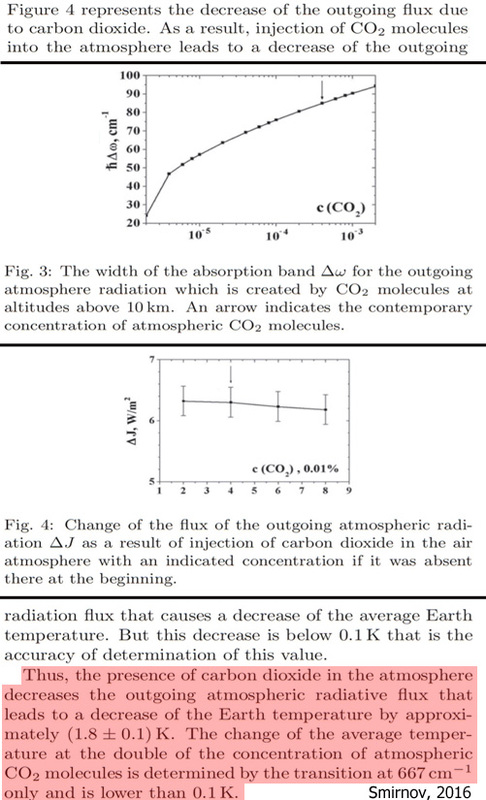 In particular, doubling of the concentration of CO2 molecules compared to the contemporary content increases the global Earth temperature by ΔT = 0.4 ± 0.2K. … From this we have that the average temperature variation ΔT = 0.8 ◦C from 1880 up to now according to NASA data may be attained by the variation of the water concentration by 200ppm or Δu/u ≈ 0.07, Δu = 0.2. 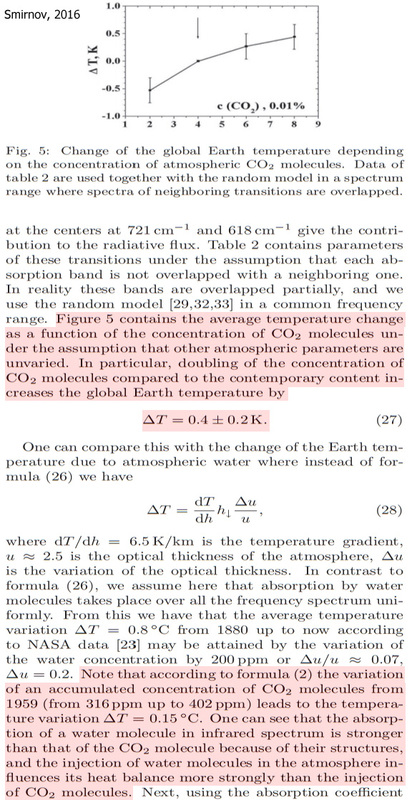 Note that according to formula (2) the variation of an accumulated concentration of CO2 molecules from 1959 (from 316ppm up to 402ppm) leads to the temperature variation ΔT = 0.15°C. One can see that the absorption of a water molecule in infrared spectrum is stronger than that of the CO2 molecule because of their structures, and the injection of water molecules in the atmosphere influences its heat balance more strongly than the injection of CO2 molecules.